Turn a boneless turkey roast into a delicious and easy meal that the whole family will love with this recipe for Crock-Pot Turkey Roast with Rice. It is affordable and family friendly and the turkey, rice and veggies make a complete meal! Crock-Pot Turkey Roast with Rice is one of my families favorite meals. I have made it with 2 different kinds of turkey roasts. I always use a boneless turkey roast because…well who wants to mess with bones! The first time I made this recipe I used a Jennie-O Festive Turkey and Gravy in a roasting pan. I’ve done it both in a regular oven and a crock-pot, however when you do this recipe version you won’t be adding any onions or spices to the turkey. It will stay very moist in the roasting pan and the gravy adds enough spices that I only add salt and pepper to taste once we are eating. The second time I made this recipe (and the one I Recommend) I used a regular boneless turkey breast roast, I can add onions, garlic and various spices with the turkey roast. My go to spice is Mrs. Dash seasoning blend, because it adds a ton of flavor. My turkey came with a gravy packet which I used in the recipe. If your turkey does not come with a gravy packet just buy a packet of turkey gravy mix from your grocery store, or you can omit it and just use some of the cooking liquid from the turkey after it as roasted in the slow cooker. You can loosen up the butchers string so that when you remove it after you cook it will be easier to pull off. I make 3 cups of rice. You can use a rice cooker or just use minute rice on the stove top. After that I add some steamed frozen veggies (I just buy the frozen vegetables that come in steam in the microwave bag). Add some salt, pepper and whatever your family enjoys for spices and voilà you are ready! This recipe was cooked in a 6.5 quart slow cooker. However it should work fine in a 6 quart or larger slow cooker. 3 cups White Rice cook in rice cooker or on stove top. Line a 6.5 quart slow cooker with a Crock-Pot liner or spray with non-stick cooking spray if desired to make clean up easier. Loosen the butcher's twine that is placed on the turkey (optional) and place the thawed boneless turkey roast in the bottom of the slow cooker. Prepare the packet of gravy that either came with your frozen turkey roast or the packet of store-bought gravy mix according to the package directions and pour the gravy mixture over the turkey in the slow cooker. Season the turkey with salt, pepper and Mrs. Dash seasoning blend (or whatever seasonings you want). Add the onion and garlic to the slow cooker. Cover and cook on LOW for 6 - 8 hours or until the turkey reaches an internal temperature on a meat thermometer of 165°F (74°C). About 30 minutes before the end of the cooking time cook the 3 cups of dry rice in a rice cooker or on the stove top. When the turkey is cooked remove the rest of the butcher's string and carve the Turkey roast into small edible pieces. Steam the vegetables during this time. Once the turkey is ready, add the rice, vegetables and enough of the turkey juices from the slow cooker to make it moist. You will most likely want to add more salt, pepper and various spices that your family enjoys. Mix it well. Once that is done you area ready to serve! 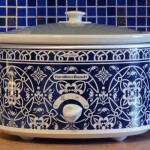 Love these crock pot ideas and love my crockpot because it really simplifies cooking.